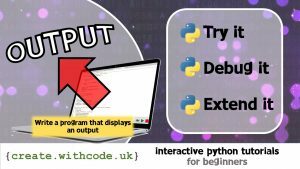 Free computing teaching and learning resources. 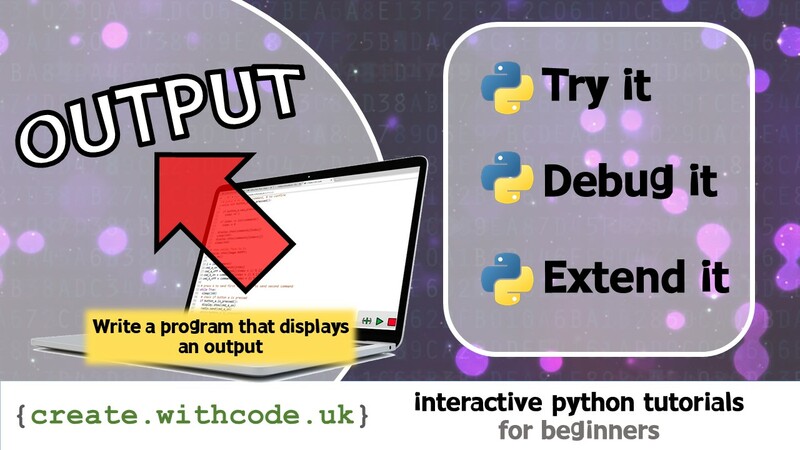 Below you’ll see some example python code that will output three things to the screen. Press Ctrl + Enter to run the code. Click on your score in the top right corner of the code editor to see what your code needs to do. Any line of code that starts with a # is a comment: it doesn’t affect how the program runs, it’s just there to help explain what the code does. Notice that you’ll need to put a \ in front of the " like you see in front of the word Hello. This is called ‘escaping’ the " because " is a special character used to surround all the text you want to output to the screen. Notice that line 7 and 9 has """ at the start and end of the text to display instead of just " . The triple quotation marks mean you can write text over multiple lines. On the next page you’ll get some code examples that have been deliberately broken for you to try to fix. Unless otherwise stated, all resources on blog.withcode.uk are published under a Creative Commons license. Use, adapt and share but please link back here to acknowledge where you got the resources from.